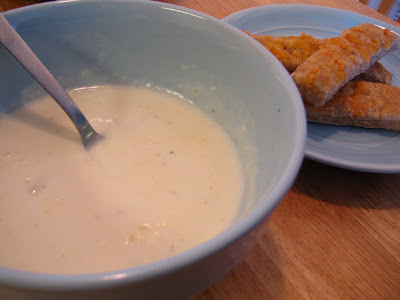 Potato Soup," I actually prefer the potatoes boiled. The breadsticks featured in this picture are my favorite (and extremely versatile) recipe, which I'll post later. Freezer instructions: Prepare roux as instructed but add half the broth instead and thicken. Add mashed potatoes to the other half of the broth and combine with roux. Fold in cooked potatoes and freeze (will be very thick). Thaw on stovetop and add milk; cook for about half an hour. update: We had this for dinner tonight, and Bryan & I both LOVED it! I would like to try it with carrots & corn, but B says I'd better not -- he loves it *as is*. =) What a great food-storage-friendly recipe to have in our file. Thanks for sharing it! !